New year means new resolutions! So why not make yours to see more live music? Or discover your new favorite band? Well you can do all of this by heading out to any of these fine gigs coming up this January. These events are the perfect way to distract you from the winter blues and sure to offer something for everyone's tastes. The wonderful folks at The Kids Are Solid Gold present this intimate gig featuring the dark and intensely tantalising band; The Howl & The Hum. Creating cinematic soundscapes with their guitar driven sound, the York-based four-piece have been causing a real stir across the UK in recent months. Now though, they are embarking on their biggest UK tour to date that also correlates with the release of their new track 'Portrait II' which promises to be real blockbuster. With a year of touring and festivals behind them, we expect a well-honed show from frontman Sam Griffith and his fellow bandmates that will provide a feast for the senses. And what better match could have been chosen to support than our very own local magical soundscape creators, the sublime Sauvage. A brand new intimate venue has launched as part of the legendary Riverside that offers emerging bands a platform to show us what they are made of. 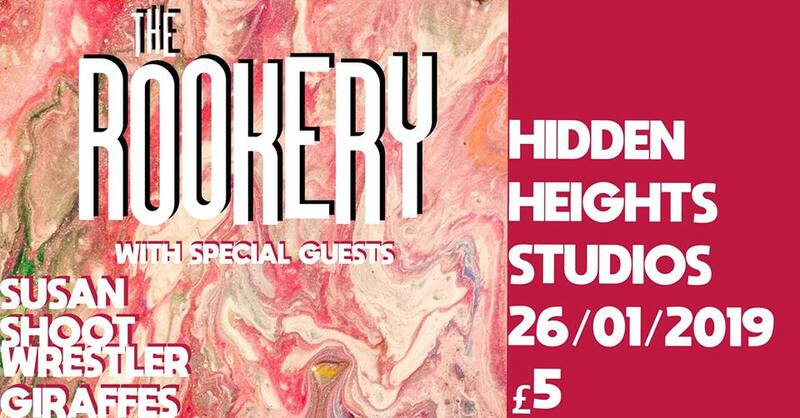 Having the honour of playing the debut show are three unique sounding acts from across the North East that all have it in them to make it onto the stage of its bigger brother in the near future. Twisting upbeat garage rock with straight-talking themes, Palm Beach bring an energy driven by a rhythm that is hard to resist. Laurens court meanwhile, are taking things into the dark and twisted realm of alternative rock that is sure to send your spine tingling as you are hypnotised by the band's haunting live show. And last but most definitely not least, White Houses are set to impress with their highly polished and confident performance that shines thanks to classic rock melodies and imposing vocal tones. Even if these maestros of the music jam have now also turned their sights to Manchester, the Rookery are still not finished with the North East and are instead taking us to new places across Tyneside. This latest edition of their showcase gig nights is taking place at The Hidden Heights Studio which is hidden indeed (tucked under the railway arches in Gateshead) to provide the perfect venue for performances from the raucous indie rockers Susan , the riff-tastic Shoot Wrestler and beat-driven melancholic-rock duo Giraffes. The Ouseburn's cozy pub/gig venue The Cumberland Arms is to play host to, and celebrate, the 15 year anniversary of local live music promoters Prancey Dog. The cleverly named PranceyFest will be a 2 day affair with the Saturday being a ticketed event and the Sunday a joyful free-for-all. The line-up itself is brimming with acts that have featured at some of the promoters' many gigs over the years, including Withered Hand, Mouses, Roxy Girls and John Egdell on Saturday, followed by FRET!, Swine Tax and Thomas Truax and more on the Sunday. And if that's not all, profits raised from the weekend will go to Maggie's Cancer Charity. Here's to many more years for this fabulous music loving doggo! Everybody's favourite fun-factory Kahuna provide their latest offering of grooving ska meets punk-pop with their single 'All The Same', and of course there is no better place to celebrate a new release than the legendary Cluny. The Newcastle six-piece have already blown our minds on numerous occasions with their captivating live performances, delivering their wildly influencing sound that is impossible not to let loose too with knee shaking moves. Upbeat and blood-pumping yet with real deep undertones, Kahuna are a band that have to be seen live to appreciate their skill and passion for their music so what better chance are you waiting for? Support comes from gritty pop-punk outfit Northern Horizon, female-fronted rock assembly Thieves of Liberty and ska-punk-funk-hodge-podge Goodsprings. 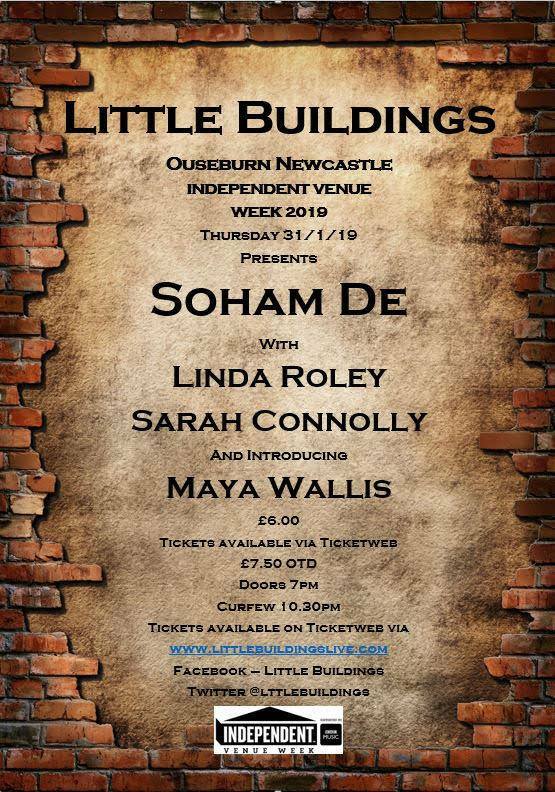 The long-awaited return of Newcastle's sublime vocalist and songwriting talent Soham De is finally here. This may be his first headline shows in years, but Soham De has certainly been busy... touring far and wide while also releasing his utterly stunning 2018 EP 'The Next Nowhere'. Many voices are described as haunting and spine tingling, but Soham De is one of the few that can actually stop you in your tracks, pulling you in with beguiling words and gravely, rich vocal tones. He is a truly underrated talent that deserves to be heard, and on the 31st you get the chance to do just that, in the intimate setting of Little Buildings. Making this delight of a show even more special are chilling performances by Lesley Roley, Sarah Connolly and Maya Wallis. Tissues recommended!